For a full list of our tours in Turkey with dates and prices, please scroll down. Turkish cuisine is renowned for its varied flavours and an ever-present emphasis on fresh ingredients cooked to perfection. Food is a fundamental part of Turkish culture, discussed at great length by all members of society. The sights and aromas of food being cooked, prepared and presented will surround you in any urban setting: markets, fresh produce displays, teashops, coffee houses, cafes, bakeries, restaurants and small speciality shops are everywhere you look. It is hardly a surprise, given this deep and abiding interest that Turkish chefs have become culinary artists with a keen eye on the presentation of their dishes: Turkish cuisine truly is a feast for all the senses. The wide variety of healthy and delicious mezes, deeply flavoursome slow roasted meats, smoked vegetables, barbecued fish, sticky pastries with honey and almonds and exotic deserts with pomegranate, rose and apricot all combine to make Turkish food one of the most exuberant and delicious cuisines in the world. 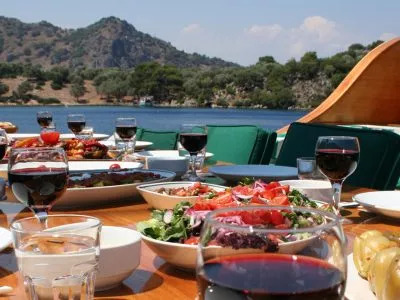 Our gastronomic gulet cruise is a voyage of discovery through Turkish coastal cuisine. You will see and taste countless delights on this tour, from the daily dishes prepared by the on-board cook using fresh local ingredients, to cooking demonstrations in traditional restaurants, and getting hands-on to create some excellent regional delicacies. The vibrant colours, delicious aromas and mouth-watering tastes of Turkey are combined with daily adventures to explore some of the country’s most impressive ancient sites; personally escorted by a leading archaeologist. Average rating 5 out of 5 from 372 reviews for Food Tours in Turkey, according to AITO reviews. We'd like to single out our tour guide Serdar for particular mention - he really made the tour special. His knowledge and enthusiasm about the archaeological sites and history were a definite bonus and the arrangements for the gastronomic outings ashore were all terrific. We should also mention the cooking demos and meals onboard, which were delicious. 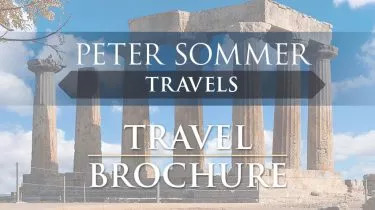 We really enjoyed our Gastronomic Gulet Cruise and hope to sail with Peter Sommer Travels again sometime.